(September 01, Mannar, Sri Lanka Guardian) The Secretary of Defence, Mr. Gotabhaya Rajapaksha, accompanied by the Chief of Defence Staff, Air Marshal Donald Perera and the Commander of the Navy, Vice Admiral Wasantha Karannagoda, visited Mannar last Saturday, 30th August 2008, in order to assess the security situation in the area. The itinerary of the visit comprised of visiting and assessing security condition of the area under North Central Naval Command. They had visited the naval detachment at Irrukkalmpiddy- the naval installation closest to un-cleared areas, the naval base in Thalaimannar, Special Boat Squadron and the Rapid Action Boat Squadron. He also declare opened the newly constructed two-storied North Central Naval Command Headquarters in Mannar which was built by the naval personnel in the civil engineering branch of the navy within a short span of time like three months saving a large sum of money that would have incurred. 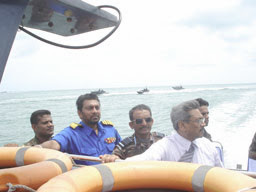 In his visit, the Secretary of Defence, Mr. Gotabhaya Rajapakshe, had inspected the Special Boat Squadron and the Rapid Action Boat Squadron which has been imposing a severe threat to the LTTE activities in the Mannar Sea and had also spoken to the troops. The boats and the craft used by the Special Boat Squadron and the rapid action Boat squadron, on board one out of which the Secretary Defence sailed around in his inspection tour, have been constructed by the personnel in the naval engineering branch utilizing indigenous material and expertise. The SBS and Rapid Action Boat Squadron very recently raided the Iranativu Island which was under the presence of LTTE cadres. The naval troops deployed in the North Central Command have successfully been putting in a blockade on the sea route of smuggling weaponry and other war-like materials by LTTE from the narrow sea strip in the Gulf of Mannar.